This is the last week of my show in Paris at Galerie Daniel Maghen, ending on Halloween night. The opening was a great success as I sold quite a number of the new paintings I’ve been sharing here on Muddy, and the gallery is eager to do another show in about two years. I already have plans to paint large, grand themes! Initially, the gallery’s request was for me to paint whatever I wanted. Who wouldn’t love to hear that? But it also means that it comes with the responsibility to produce work that excites people. I’d learned many years ago that if I can focus enough to excite myself about a subject, then it’s more likely that a client will respond to that same excitement if I can get it across in the painting. 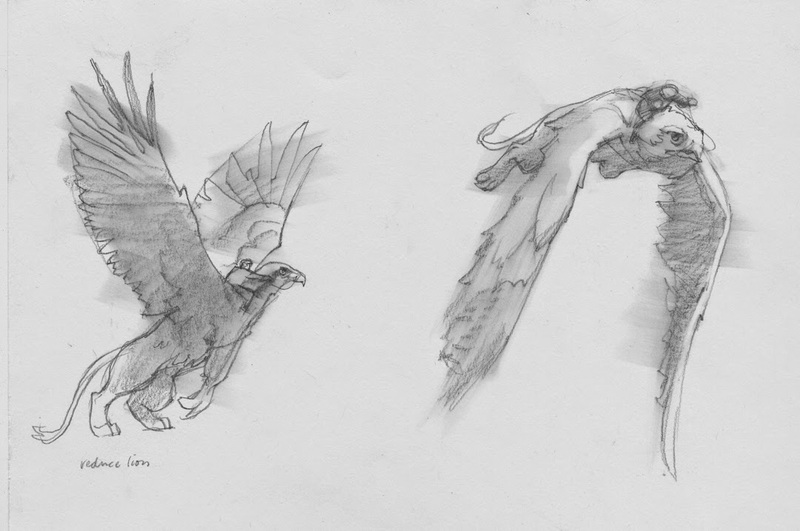 Flight Line was the first piece on my board, derived from my interest in raptors, aviation, and pilots. Combining a classic mythical creature with this theme seemed out of place, but oddly made sense. 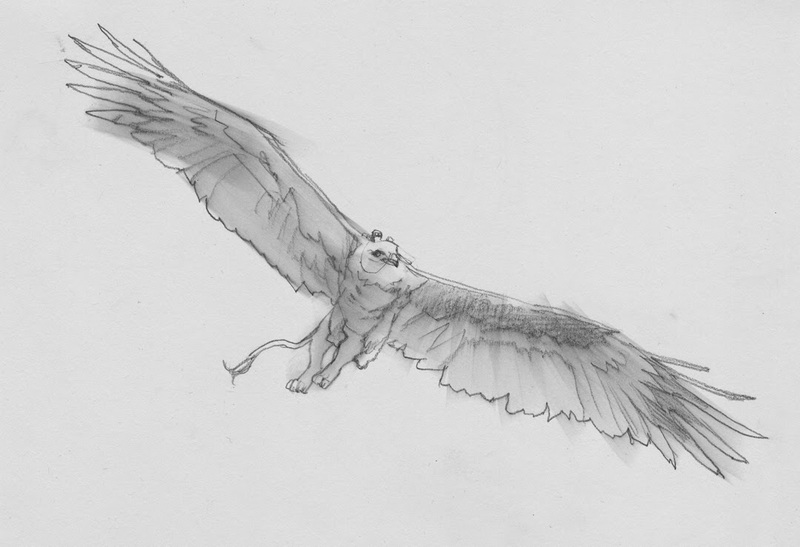 I made several sketches and still wasn’t sure that anyone would appreciate what I loved about it. The image’s seed was planted from watching so many movies about WW1. The pilots rallying for their sortie. Similar to the canvas biplanes waiting along the dew grass flight line of the Lafayette Escadrille, the gryphons pull against the restraints of the mechanics who prep the beasts for launch, awaiting their individual pilot-trainers. 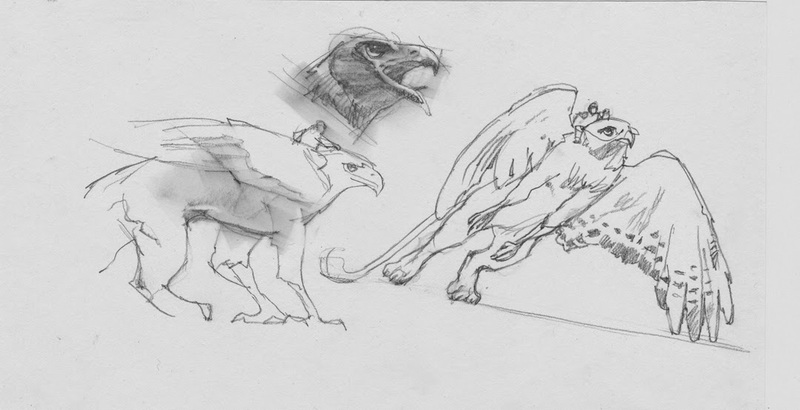 To build the image, I sketched each gryphon and pilot separately, then combined the pilots with their birds. 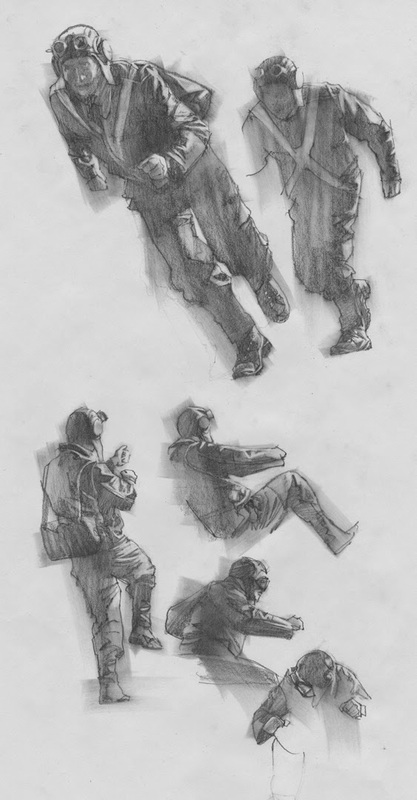 I traced these sketches onto separate sheets of tracing paper and then laid them onto a main sheet so I could move them around, to find just the right composition. I projected that final sketch onto my canvas and traced it off. The finished piece is about 48” across and took several days. Lots to cover. I’ve got a new world to write about now. The visual tease is enough for me to create the background history to flesh out the story. This is how stories start, especially for artists, and especially for the new crop of artist-authors that are coming up. Flight Line was also the first painting to sell in the show, followed by Night Patrol which is also part of this same world.